Lauren had always wanted to visit Ireland, and that was our original reason for heading overseas. As for me, I was certainly willing to visit the well: As a teenager, I was totally immersed in, and passionate about, old-time American fiddle music – which led to my discovery and love of Irish and Scottish tunes. I learned to back up fiddle tunes on guitar and to play the melodies on both guitar and mandolin. When I moved to Cambridge, Massachusetts, in 1970, I played regularly at a wonderful Irish session at a pub called the Plough and Stars. Then, when I moved to western MA to complete my degree at U. Mass, Amherst, I joined Sheehan’s Reel, a fine Contra Dance band led by Peter Temple, a hammered dulcimer player. Fiddler Van Kaynor was also in that band. In Sheehan’s Reel, I learned many more tunes from the Irish repertoire on mandolin and banjo mandolin, and we traveled all over the region playing for dances. The other parts of our trip (Washington, DC, area and Stockholm, Sweden) grew out of the excitement of having a new CD to support and share and the opportunity to visit old friends in various cool places more-or-less along the way. But Ireland was our original destination. Besides traditional Irish songs and tunes, we both love bucolic scenery, hearty food, humor, history of any age, sheepdogs, and the sea, and we looked forward to the whole “Gestalt” of the place. 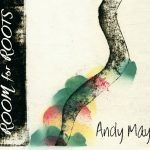 Since the release of Room for Roots, there had been major new demands on our time on top of our regular activities. August, September, and the first week of October were a whirlwind, so for this leg of the tour, we thought we would just enjoy the Irish landscape and relax a bit. And, maybe we’d luck into some lovely music ….and perhaps l might even join in on a tune or two. I still had my guitar and mandolin with me, of course – both in their massive airline-proof (I hoped) travel cases – so I was ready for anything! We had no plans beyond a rental car reservation and a thought to head west to County Clare. When we landed in Dublin, we dropped in at the Ireland Information Center in the airport to see what they suggested. We asked the woman at the desk where in Clare we should go to hear some good traditional music. “Doolin,” she said without hesitation, so to Doolin we went. Good call. 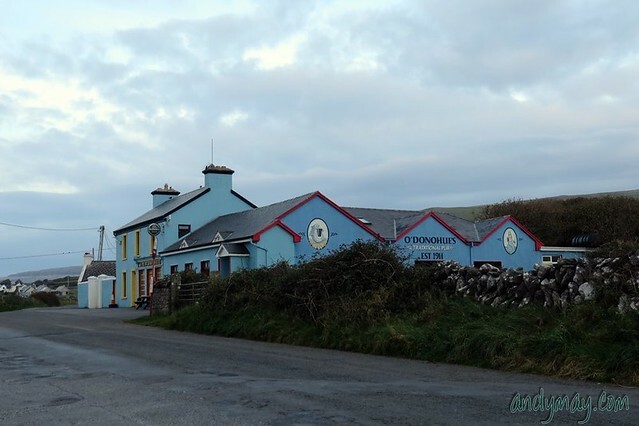 We traveled the highway west nearly to Galway then took the Wild Atlantic Way, a lovely, winding coastal road, south and arrived in Doolin as night was falling. We found a vacancy at a B&B, ditched our bags, and headed to the pubs for dinner and maybe some music. Not wanting to presume, I left the instruments as well. We wound up in O’Connor’s Pub, where there was a wonderful traditional session going as we entered. Little did we know at the time that this pub is one of the top venues in all Ireland for exactly what we were hoping to find. Session at O’Connor’s Pub, Doolin. There was something in the “feel” and quality of the music in Gus O’Connor’s Pub that night that drew me in. In the course of a friendly chat with one of the musicians during a break, he discovered that I’m a musician and immediately asked if I wanted to join in. I did. I zipped back to our room, grabbed the instruments in their mega-cases, and hauled them back to the pub. I plunked down on a chair at the edge of the circle of players with my guitar. The flutes, concertina and fiddle began to play and I followed with rhythm and chords as I had learned to do so many years before. What a delight! Tunes, talking, laughter, and song…. The next thing I know, we’re closing the place down. Lauren and I looked at each other and grinned. One of the players that night was Christy Barry on flute, whistle, and spoons. It turns out, Christy is an All-Ireland champion on both tin whistle and flute and a Lifetime Achievement award-winner. Also playing was his friend, James Devitt, on fiddle and Terry Bingham on concertina, as well as others whose names have escaped my memory. Christy is at the center of much of the great music in that locale, including opening his home for visitors as the Doolin Music House. He is a kind host who has a deep understanding of, and love and respect for, the music of the region. And he is a remarkable player. We played music together three more evenings before we left the area. The last session, at the Roadside Tavern in Lisdoonvarna, included Colin Nea, who is an All-Ireland button accordion champion. I felt greatly honored and happy to be invited to be part of these sessions. Besides the music, the scenery in western Ireland is breathtaking. Based out of the lovely Riverside Cottage B&B and fortified each morning with a fine breakfast, and suggestions and directions, provided by our hostess, Breda Meehan, we spent the next four days hiking and driving and riding on ferries. There was so much more to see and do than our time would allow! The people we met were friendly, kind, and down-to-earth, and the land and history are fascinating. And, being Americans, driving on the left side of the narrow country roads in the area – roads that are bound on both sides by venerable rock walls and frequented by barreling tour buses – was a thrill in itself! One highlight of our visit was a long walk along the Cliffs of Moher with Pat Sweeney. Pat, a farmer whose land backs up to the cliffs, was responsible for bringing together dozens of his neighboring landowners to establish the easement and actually build the trail from Doolin to Liscannor. So far, they have completed the trail from Doolin to near the Cliffs of Moher Visitors Center, which is not quite half-way. A footpath goes the rest of the way to the center, and the farmers will pick up building the trail again this winter and again each winter until it goes all the way to Liscannor. 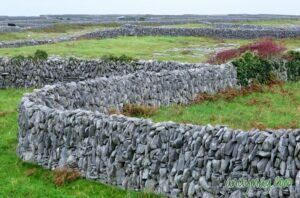 We took another delightful hike in – or on, as the case may be – the Burren, a remarkable limestone mountain which supports such an interesting and important ecosystem that is now a national park. Nearby, we visited Caherconnell Stone Fort, an ancient ring fort. Besides hosting a wide variety of archaeological and geological studies and activities on their property, the owners also raise sheep and cattle and present sheepdog demonstrations. We stayed for a demonstration, which was a great treat. The walls of Ennis Oirr. Our other big adventure was to Ennis Oirr (Innisheer), the smallest of the three Aran Islands and the closest to Doolin. The island is covered with an amazing network of ancient dry stone walls, dividing it into postage stamp-sized pastures – which Lauren found awesome. Some of the walls are a good seven feet high! We didn’t manage to make it to the ruins on the island, but we had a good long walk along the roads around the pastures. We’d have loved to stay longer, but I was going to a music session that evening and in the morning we were headed back to Dublin. Plus, weather was moving in and the ferry back was leaving early. So the next day, we drove from Doolin to Dublin, turned in the car and checked into an airport hotel. That evening we hopped on a bus and set out to find the historic Cobblestone Pub in the very old Smithfield area of Dublin. Our good friend, musician Rick Lee – who was a great singer, piano player, and banjo player and was famous for his love of jamming – always said that one of his favorite jams was the session at the Cobblestone. I had known Rick since I was in my teens, and, sadly, we lost him a couple of years ago. This seemed like a lovely connection and a good way to honor him. We got there late on Saturday evening and the pub was packed with folks drinking and talking. In the front corner sat the musicians – fiddle, flute and Irish bouzouki. It wasn’t long before I was invited to join in, and I played a few tunes on guitar with the band in honor of the memory of my old friend. That was the official end of the music on the “Diggin’ Deep for Roots Tour.” The next day we went sight-seeing around Dublin, which was fabulous, and the following morning we headed back to the states.